New York : Workman Pub., c2005. 381 p. ; 21 cm. 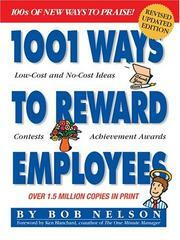 1001 ways to reward employees / Bob Nelson. $c Statement of responsibility Bob Nelson. 250 Edition $a Edition statement Rev., updated. ed. 650 Subj:Topic 0 $a Topical term Incentives in industry.